On closer inspection, we find science and especially mathematics throughout our everyday life, from the tap to automatic speed regulation on motorways, in medical technology or on our mobile phone. 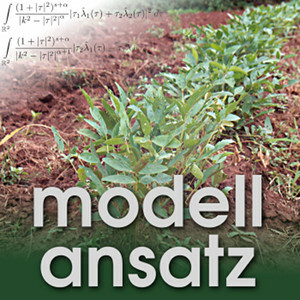 What the researchers, graduates and academic teachers in Karlsruhe puzzle about, you experience firsthand in our Modellansatz Podcast: "The modeling approach“. This is the first of four conversation Gudrun had during the British Applied Mathematics Colloquium which took place 5th – 8th of April 2016 in Oxford. Josie Dodd finished her Master's in Mathematical and Numerical Modelling of the Atmosphere and Oceans at the University of Reading. In her PhD project she is working in the Mathematical Biology Group inside the Department of Mathematics and Statistics in Reading. In this group she develops models that describe plant and canopy growth of the Bambara Groundnut - especially the plant interaction when grown as part of a crop. The project is interdisciplinary and interaction with biologists is encouraged by the funding entity. Why is this project so interesting? In general, the experimental effort to understand crop growth is very costly and takes a lot of time. So it is a great benefit to have cheaper and faster computer experiments. The project studies the Bambara Groundnut since it is a candidate for adding to our food supply in the future. It is an remarkably robust crop, draught tolerant and nitrogent inriching, which means the production of yield does not depend on fertilizer. The typical plant grows 150 days per year. The study will find results for which verfication and paramater estimations from actual green house data is available. On the other hand, all experience on the modelling side will be transferable to other plants up to a certain degree. The construction of the mathematical model includes finding equations which are simple enough but cover the main processes as well as numerical schemes which solve them effectively. At the moment, temperature and solar radiation are the main input to the model. In the future, it should include rain as well. Another important parameter is the placement of the plants - especially in asking for arrangements which maximize the yield. Analyzing the available data from the experimental partners leads to three nonlinear ODEs for each plant. Also, the leave production has a Gaussian distribution relationship with time and temperature. The results then enter the biomass equation. The growth process of the plant is characterized by a change of the rate of change over time. This is a property of the plant that leads to nonlinearity in the equations. Nevertheless, the model has to stay as simple as possible, while firstly, bridging the gap to complicated and more precise models, and secondly, staying interpretable to make people able to use it and understand its behaviour as non-mathematicians. This is the main group for which the models should be a useful tool. So far, the model for interaction with neighbouring plants is the computational more costly part, where - of course - geometric consideration of overlapping have to enter the model. Though it does not yet consider many plants (since green house sized experimental data are available) the model scales well to a big number of plants due to its inherent symmetries. Since at the moment the optimizaition of the arrangements of plants has a priority - a lot of standardization and simplifying assumptions are applied. So for the future more parameters such as the input of water should be included, and it would be nice to have more scales. Such additional scales would be to include the roots system or other biological processes inside the plant. Of course, the green house is well controlled and available field data are less precise due to the difficulty of measurements in the field. During her work on the project and as a tutor Josie Dodd found out that she really likes to do computer programming. Since it is so applicable to many things these skills open a lot of doors. Therefore, she would encourage everybody to give it a try. Asha Sajeewani Karunaratne: Modelling the response of Bambara groundnut (Vigna subterranea (L.) Verdc) for abiotic stress, PhD thesis, University of Nottingham (2009). A.S. Karunaratne e.a. : Modelling the canopy development of bambara groundnut, Agricultural and Forest Meteorology 150, (7–8) 2010, 1007–1015.